Well it has certainly been a little while since my last review so today I picked out one of my latest pre workouts, which is the Flyte Sport pre workout. In this Flyte Fuel Build Intensity Review, I’ll talk about flavor, performance, overall formulation quality, and even packaging. And I’ll do so in classic Fit Life Allie fashion- meaning it’s going to be super informal, super fun, and just easy-reading. You are trying to decide what pre workout to buy, not researching for a research paper. This should be fun, people! So why don’t we basically just jump right into the pool and start talking about this exciting new pre workout from Flyte Sport. Flyte is not a company that was on my radar prior to last week. But I think it is actually a pretty fun little company. The black and teal is a welcome change from some of the more boring companies in terms of appearance. But more on that later. First, we need to take a second to understand that this is my ONE HUNDREDTH pre workout or women review. Guys. Can you even believe that? What started as my crappy high school hobby project has snow-balled into one of the top supplement review sites on the entire internet. That’s just absolute madness! I actually have been so humbled by having so many loyal readers and subscribers that like, it’s just amazing to be at this point where I’ve actually reviewed hundreds of supplements. It’s so cool. But. I’m just glad. Glad that I can spend so much of my time on this fun hobby. Pre workouts are just fun. I love them. As you can tell. But. 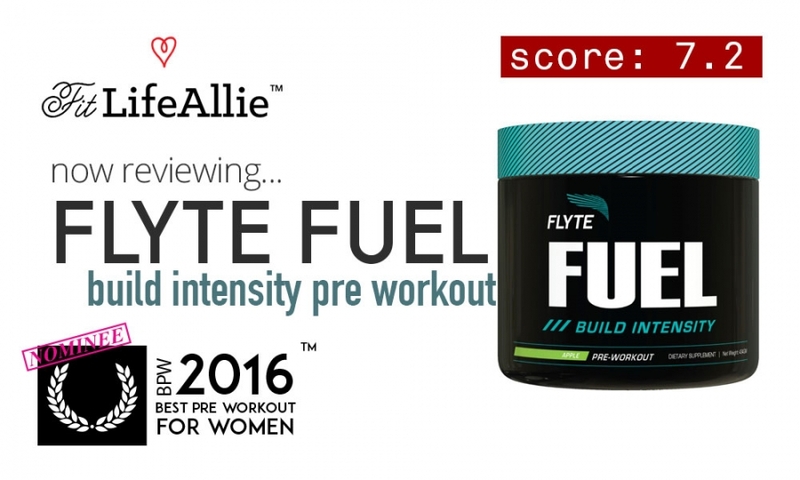 Enough celebrating, let’s get down to the reason we’re here- the review of Flyte Fuel pre workout. We might as well start with the flavor. What’s the Best flavor of Flyte Fuel Build Intensity? I wish I could speak to all 3 flavors of Flyte Fuel pre workout, but unfortunately I only reviewed the Apple, and the Blue Raspberry. I think the the other flavor sounds really intriguing, but I’m not so sure if it was going to be the right one for me. Raspberry Lemonade usually comes out pretty good with pre workout because the bitterness can mask the foul-taste of some of the the more potent ingredients. But. The Apple flavor is probably the best flavor of Flyte Pre Workout. on first thought, it doesn’t sound all that great. I’m actually probably the last one who will sing the praises of an artificial apple flavored anything. But it’s good, you’ll just have to trust me on that one. It’s sweet and almost ‘juicy’ tasting, even though it’s totally artificial, it does a nice job of tricking the brain into thinking it’s natural apple. It’s good. The blue raspberry flavor of Flyte Fuel Build Intensity isn’t quite as sweet, and it’s much more sour than the apple, which was surprising to me. The blue color is, well, very blue. That’s what you get from artificial colorings. I think they should try making a natural version of Flyte, because this flavor isn’t even very good. So if it’s not going to taste very good using artificial ingredients, why not just make it taste TOTALLY bad but at least be all-natty? That’s what I want to know. But. Let’s talk more about performance. As you can tell, I do like the apple flavor Flyte pre workout better, but on average this isn’t the best-tasting pre workout. Performance is, well, just ok. I found this pre workout to behave very, sort of, ‘down the middle’ in terms of the workout benefits. I have had much better workouts, and I’ve had much worse workouts. But I was expecting more from Flyte. I’ll be honest with you. This is something we’ll discuss in more detail in the final Review Summary below, but basically for the price, I wanted much more of a solid performing pre workout than I got. I went into the gym sporting two full scoops of Flyte. You would expect that to give all kinds of punch, right? Not really the case. Flyte just seemed to come and go, in a weird way. It was all over me at the start. I was like, super fired up to crush my workout. I could feel the beta-alanine kicking in and working it’s magic. I could feel the yohimbine making my breath and my feel ‘cold’ like it always does. And the first fifteen minutes of my workout were fantastic. I was flying around the gym. My supersetting was on point. I was hitting my back and my hamstrings. I felt really, really good. The pre workout was amplifying and enhancing my workout. I really had the Intensity. I had the Fuel. I had it all. And then about twenty minutes into the workout, or maybe twenty-five, I just totally hit the floor. The effects started to wear off, and the workout just took a nose-dive. I know what you’re thinking. ‘You got tired’. Um. No. People. I do this workout time and time again, and never have I EVER crashed as hard as I did when I took Flyte Fuel. It was a real shame because I was going so well. But the performance effects of Flyte pre workout really do just wear off and leave you high and dry. I felt like I could have just laid down and gone to sleep right there in the gym. Let’s look at the formulation and see why that might be. Ok, so here’s why the product just sort of fizzes out. Flyte uses a 4.8 gram proprietary blend consisting of Beta alanine, Choline bitartrate, GABA, caffeine, alpha GPC, synephrine, hordenine HCL, yohimbine, and huperzine A. That’s literally ALL energy. There’s no strength or endurance properties to be found anywhere in the formula. At all. And on top of that, the entire blend is under five grams total, which is a pretty small little scoop. I really think in the modern day and age, pre workouts can’t be using proprietary blends to mask the actual ingredient quantities. There isn’t enough ‘meat’ on the bones of this pre workout for me to give it any higher of a grade than a ‘C’. I just don’t think it’s a very good product from a formulation standpoint. Check that. I KNOW it’s not a very good product from a formulation standpoint. Let’s talk about the packaging too while we’re at it. Well, here’s another area that I haven’t been too overwhelmed with Flyte pre workout. But then again, not too many products DO make me very excited when it comes to the appearance. This one in particular just hasn’t been terribly impressive to me. The product uses a plain old black jar, topped off by a teal lid that just does not do enough to set it off. I think the sort of textured appearance do at least add some excitement to Flyte Fuel, but it’s not enough to overcome the boringness of the black and white lettering. The name ‘Fuel’ is OK for a pre workout, but then again I think it has already been taken by Fate Fuel pre workout. So… yeah…awkward. Lol. Not sure if they’ve had discussion over that. But anyways. This pre workout needs work on branding. Really the whole brand needs work on branding. Their Insta is a hodgepodge of veiny steroid guys, and average looking fitness chicks. I just can’t tell where they’re going. It’s like a poor man’s Shredz attempt, and I don’t know that they’re pulling it off. But. Hey. I’m cheering for them because I do think with some improvement to their products they can pull up to a level even with a brand like Inspired Nutraceuticals, which is another young brand that is doing it ‘right’ in my opinion. But let’s wrap this up.